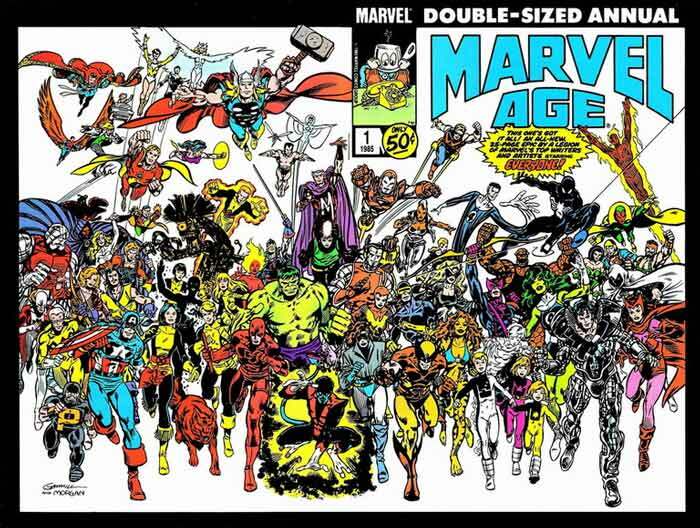 The concept of the issue is that someone is calling all of the superheroes of Marvel circa 1985, and getting them to say their names, powers and upcoming villains. The goal was to have each page done by the creative team, which the opening text piece states that they were successful for the most part. The biggest omissions are Chris Claremont and John Romita Jr., both of whom were in Paris at the time doing research for Uncanny X-Men 200. Google Images didn’t exist, and I imagine there were no photo books or something – or really what happened, Marvel offered to send them and they just said yes. Magneto answers the phone, tells whoever is on the other end that he isn’t Magneto but Fred Xavier, Charles’ younger brother and that it is a simple school for the gifted. Kurt teleports in. Colossus comes charging in. Storm and Cyclops both come in at the same time, claiming that if the caller wants to speak to the leader, they should answer it, then bicker over who the leader is. Rachel comes in going on about how her past is terrible in the future. Then Kitty comes in telling them that Wolverine is playing tag with Rogue and everyone goes outside. Rachel hints that Nimrod might show up at one point. Pretty decent way to show powers and the personalities of the team. So some time later, Dani picks up the phone. Pretends that the school doesn’t have ‘new mutants’ but new students. Then that cast comes in, Doug speaking different languages, Karma, Cannonball speaking about her girlfriend Lila Cheney, Sunspot mentioning the Hellfire Club, Wolfsbane mentioning her father, Reverend Craig. Magma is there, Magik comes in talking about the Hellions and lastly, Warlock talking about his father, Magus, is still out there trying to hunt him down. New Mutants is welcoming new artist Steve Leialoha starting with issue 36. Uncanny X-Men 200 is the Trial of Magneto and issues 202 and 203 will be Secret Wars II tie in issues. I really do enjoy how Marvel Age is a perfect time capsule for what Marvel was like at the time.